A man is walking away. In some decks, he may be walking backwards. It may be night. He may be partially cloaked. 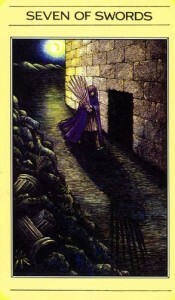 Sometimes it looks like he might be sneaking off, similar to the image in the five of pentacles. He’s holding swords. In some decks seven of them, in others only five with two left behind. Traditionally, the two left behind seem to be within some encampment. Maybe he’s a soldier deserting, or a thief taking the swords to sell on the black market, or a spy. But the tarot is like an ink-blot and the image always subject to interpretation. Some people will see a lover sneaking around and the knowledge that they are being cheated on will suddenly come to the surface. Others might view it as a breaking away. 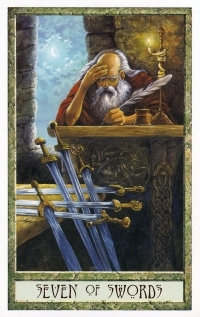 In a deck where two swords remain planted, there’s the idea that you can never really leave everything behind, or the message that you need to leave, but it won’t be easy and may require a little secrecy. Your old boss has called you and dangled before you a new possibility. You respect your current supervisor, but the firm is a sinking ship. You obviously can’t say anything till things are firmed up, but you feel as though you are being disloyal for even considering another offer. 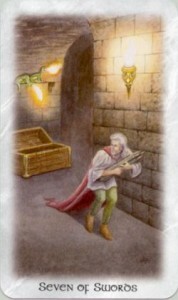 The most common interpretation of the card involves the need for diplomacy, discretion, stealth, guile. Sneaking around may not feel good, but it could prevent a war. Maybe the man in the card isn’t exactly a thief. Perhaps he’s stealing weapons from an occupying army, weapons that would be used to hurt the people he loves. Yes, it’s stealing, but is it unethical? Or maybe he’s not exactly sneaking away at all, but tricked the enemy somehow, and is afraid they’ll catch on that they’ve been had and come after him. Which leads us to the idea of discretion. There’s the famous quote: “For evil to flourish, all it takes is that good men do nothing.” But sometimes the thing you need to do, doesn’t feel right. The most ethical choice is not always the most obvious, and in some cases it may be necessary to make a choice that doesn’t seem on the surface to live up to your own ethical standards. You may feel like a thief in the night, but you might be making the best choice. On the other hand, there may be a good reason why you are feeling a twinge of conscience. Sometimes, if it feels wrong, you shouldn’t be doing it. Certainly, when the card comes up in a spread, it’s as good a time as any to reflect on your own use of guile, whether it’s in your love life, work life, or social life. Is secrecy necessary? What would happen if you were more open? If you are somehow violating the ethical standard you set for yourself, the question needs to be asked: Is it the standard that needs to be reconsidered? Or is it your behavior? This is not a card that provides an answer, but one that raises a question. 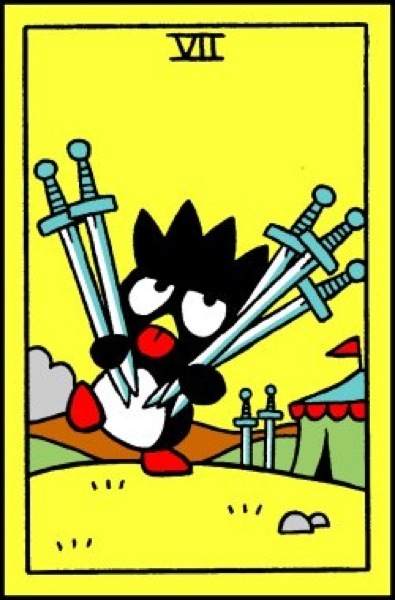 This entry was posted in Free Tarot Advice, self help, Tarot and tagged Seven of Swords, skeptical tarot, tarot, tarot readings, tarot skeptics. Bookmark the permalink.